The application of heat as a tracer for assessing river-aquifer exchanges has been mainly limited to vertical flow through the riverbed. Lateral river-aquifer exchanges may be more important than vertical riverbed exchanges if the river is deeply incised into an aquifer. Few studies have examined lateral river-aquifer exchanges and the ability of heat to constrain such exchanges. This study aims to perform a robust assessment of the limits of heat as a tracer to quantify lateral river-aquifer exchanges. It is largely based on a section of the Meuse River in Belgium (Figure 1), a river predominantly gaining in the studied area that only becomes intermittently losing in the winter time. Figure 1. Location of the study site adjacent to the Meuse River, monitored wells U5 and U3 (114 and 207 m distance from the river, respectively) and groundwater head contours as measured in April 2006. A site-based transect model established with HydroGeoSphere was first calibrated using both hydraulic head and temperature time series from two monitoring wells over 100 m away from the river (U5 and U3). However, the temperature time series were not helpful in calibrating the model because of the large distance from the river and the gaining nature of the river. The best-calibrated model was then utilised as the base case for assessing the usefulness of temperature at closer distances from the river. We extracted both head and temperature time series at a number of locations much closer to the river (i.e. 4, 5, 6, 7, 8, 9, and 10 m from the river) from the best-calibrated model. Then we analysed how the use of different synthetic heat and temperature time series as calibration targets impacts on the uncertainty of integrated river-aquifer exchange volume using the Monte Carlo approach (the river-aquifer exchange volume uncertainty is attributed to parameter uncertainties). Our results suggest that the ability of heat to reduce the uncertainty of lateral river-aquifer exchanges is directly proportional to the distance of the monitoring location from the river. In our case, the uncertainty range of the net exchange volume was reduced by approximately a factor of 3 from 4 m to 9 m (Figure 2a). This ability of course is limited to a certain range. For instance, heat cannot be used at 0 – 4 m in our case because of the occupation of the river bank, and was not useful beyond 8 m as the effect of river temperature becomes insignificant. The optimal distance is where groundwater temperature variation is no longer affected by river temperature (8 m in this study), or temperature variation is below the resolution limit of the temperature sensor. Our study also indicates that heat alone cannot constrain lateral river-aquifer exchanges better than the commonly used hydraulic head (compare Figures 2a and 2c). 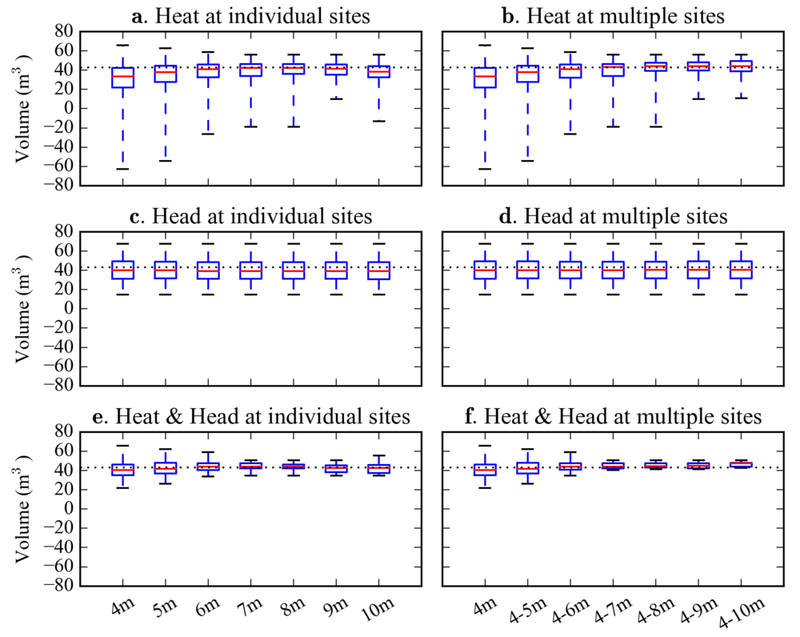 However, once combined with hydraulic head, heat can reduce the uncertainty of lateral river-aquifer exchanges significantly (compare Figures 2a and 2e). A factor of 3 – 6 reduction in the net exchange volume was observed in our synthetic case. Figure 2. Net river-aquifer exchange volume statistics for using hydraulic head and temperature time series in different manners. The left panel shows results when time series were used at individual locations (i.e., 4, 5, 6, 7, 8, 9, 10 m from the river), whereas the right panel includes results when time series were used at specific ranges of locations (e.g., 4-5 m indicates locations at both 4 and 5 m, and 4-6 m indicates locations at 4, 5 and 6 m). In each boxplot, the upper and lower bounds show maximum and minimum values, the top and bottom of the box indicate 75 and 25 percentiles, and the red bar within the box is the median value. The dotted lines show the net exchange volume for the base case model.